Small ensembles and individual musicians of the Sudbury Symphony Orchestra are available to present an educational and interactive introduction to classical music. These short presentations take place in school classrooms, libraries or gyms for small groups and provide an up-close and personal look at specific instruments of the orchestra, or certain time periods of music. Members of the Sudbury Symphony Orchestra can be made available to provide leadership to high school bands. These one-time sessions are designed to supplement existing school music programs and can be customized to suit the needs and interests of the teacher and students. Topics of interest have included work on specific repertoire, instrument care, group performance, and instrument technique. 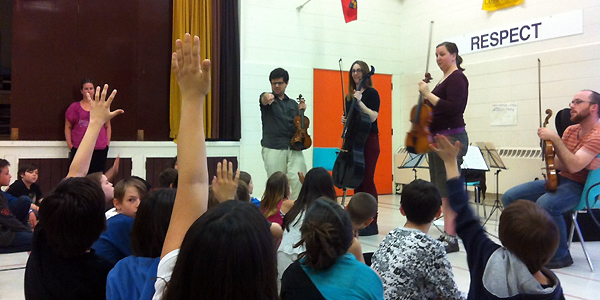 For questions, or to book one of these programs in your school, please call the Sudbury Symphony’s Outreach Coordinator at 705-673-1280 or by email.